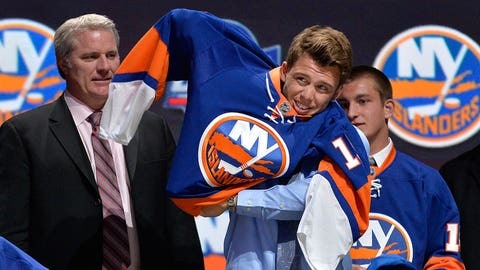 Anthony Beauvillier tries a New York Islanders jersey on for size at the 2015 NHL draft. New York Islanders first-round draft pick Anthony Beauvillier signed a three-year entry-level contract, the team announced on Friday. Selected 28th overall of the 2015 draft, Beauvillier has collected seven goals and eight assists in seven games with Shawinigan of the Quebec Major Junior Hockey League this season. The 18-year-old Quebec native enjoyed a banner contest on Oct. 10, scoring three goals and setting up two others versus Rouyn-Noranda. Beauvillier, who serves as the captain of the Cataractes, recorded 42 goals and 54 assists in 67 games last season. New York also selected center Mathew Barzal (16th overall) in the first round of the 2015 draft.